We are actively seeking caring and compassionate individuals to volunteer with us! Our hospice volunteers serve in both administrative and direct patient care roles. Direct patient care volunteers visit with our patients for companionship and support. Volunteers also assist in office activities, including tasks such as answering the telephone, filing, assisting with patient and family mailings, and data entry. As a volunteer, you will receive appropriate training to teach you further about hospice and your role. "I chose Capital Hospice because I felt that as someone interested in a career in medicine I need to expose myself to all levels of medicines and stages of care. I've felt I've been able to gain a wholesome understanding of medical care with hospice combined with my ER work, and specialty surgeon surgeon shadowing. Furthermore it has highlighted for me the need to show love and affection to our family members constantly and always be grateful for their presence in our lives. It's an unfortunate thing when your loved one stops being able to share memories with you, they are alive but not fully present." 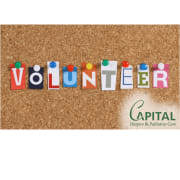 - Rajko V.
If you are interested in volunteering with Capital Hospice & Palliative Care, please contact our volunteer coordinator Tiffany Kasper directly at 630-581-5492 or tkasper@capitalhpc.com. We look forward to having you join our team!